Do you love bingo? Is Christmas your favourite holiday? If so, you will love Season Bingo. A visit to this site ensures that Christmas celebrations will be early this year. 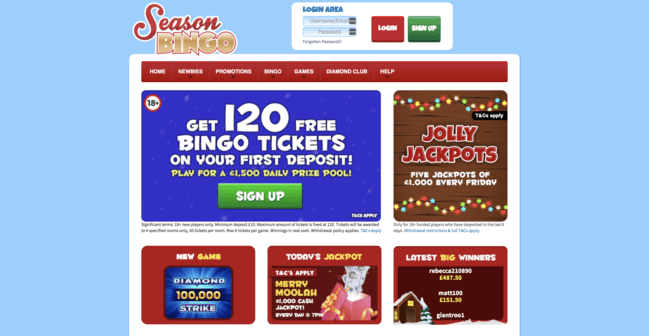 SeasonBingo.com is operated by Mandalay Media Ltd / Ignite and is powered by software from Brigend Limited, a subsidiary of Cassava Enterprises located in Gibraltar. Carry on reading our Season Bingo review to find out more about the features. GET 120 BINGO TICKETS18+ new players only. Minimum deposit £10. Maximum amount of tickets is fixed at 120. Tickets will be awarded to 4 specified rooms only, 30 tickets per room. Max 6 tickets per game. Winnings in real cash. Withdrawal policy applies & full T&Cs apply. Sign up with Season Bingo today and get your hands on some top bonuses along with the latest games. When you join the site you can get your hands on the Season Bingo promo code and latest offers. The current welcome bonus is very similar to the offers you’ll see on sites from the same network. This may be frustrating for some players but we’d still recommend signing up and giving it a go anyway. You’ll find many other promotions across the website once you sign up so make sure to check these out and get the most out of your gaming experience. If you’ve got any questions or concerns, you can contact SeasonBingo.com’s friendly staff through email and phone number 24 hours a day, 7 days a week. You could also head to their help room, any time of day, where someone shall be waiting to help you. If you’re interested to find out about the Season Bingo game and the various features available, you’ve come to the right place. SeasonBingo.com has all the standard bingo games like 90 ball, 75 ball and 5 line. There is also a free play game available with sacks of real cash to be won every day. If you’re looking to win big money, you may be interested in the progressive jackpot bingo games. If jackpots are something you like, you might want to take a look at the Genie Jackpots game. There are a few different jackpots to choose from including Lucky 90, Cosmopolitan and 5 Line. There is big money to be won in these games, so make sure to have a go if you do decide to sign up for the site. Mini-games like Noughts and Crosses, Secret Garden and Enchanted Prince are all featured upon the site and are available to both new and existing customers. Online scratch cards and European Roulette online is available too. With such a wide range of games and features to enjoy, it is no wonder why so many people sign up for Season Bingo each day. SeasonBingo.com makes use of Cassava software, which is a popular operator in the United Kingdom for bingo sites. Cassava offers a clean layout with easy to navigate functions, so you can be sure to have fun on the site without getting confused due to complicated software. When you are ready to withdraw your money, simply click the Withdraw Funds button under the Banking heading. Your request shall be processed after 48 hours. There is a limit on deposits you may put on this website. You can make maximum of £2500 worth of deposits in a day, £7500 a week and £20,000 a month. As part of the withdrawal policy, a minimum of £20 must be deposited before you withdraw any cash from SeasonBingo.com. The minimum withdrawal is £30 and the process time is 48 hours. Just like any site, there’s a limit on withdrawals you can make. You will find that you may make withdrawals up to £1000 a day. There’s a weekly limit of £5000 and a monthly limit of £10,000. Season Bingo is compatible on both smart phones and tablets. The software can be operated on iOS and Android devices and may be accessed wither through the mobile device browser or the downloadable bingo app. A number of games may be found on the app, however not all of the games are included. This is simply because if all features were on the app the program would run slowly creating a bad user experience. We would recommend trying out this website if you have enjoyed our Season Bingo review and want to find out more. You can get your hands on their latest promo codes and welcome offers when you sign up as well as playing their range of games.